The wild saguaro and red rock deserts of Arizona are the perfect (Zika and hurricane free!) Spring Break stomping ground for the whole family, whether you want hot air balloon rides, horseback riding excursions, spa time or serious Southwestern food. Passported's Brandi Wilson breaks it down with her favorite eats, sleeps and adventures in Scottsdale, and check back for our cheat sheet to Sedona and beyond coming soon. When To Go March to May is perfect: Sunny by the pool in the low 80s during the day, but chilly enough to snuggle up with a sweater by the bonfire and roast ‘smores at night. Mid-April is special, with splashes of hot pink bougainvillea and yellow and white wild desert flowers dotting the red rock landscape, while fall sees similar mild temperatures. Low season is throughout the dry heat of summer and chill of winter. What to Eat and Drink Hit up Old Town to check out the local gallery row and stay for an evening foodie stroll along the canal. Kick off with serious craft cocktails at Counter Intuitive, then plan on crispy pork belly peanut brittle heaven and a frothy cross between a Pisco Sour and a classic margarita at ever-popular, The Mission. Beckett’s Table and FnB are the tough-to-score tables of the moment, with inventive riffs on Southwestern flavors and cool wine lists, and Cafe Monarch’s pretty garden patio wins for romantic dinners out (leave the kids at home). Pop into Barrio Queen for Mexican street corn and killer tacos for lunch. 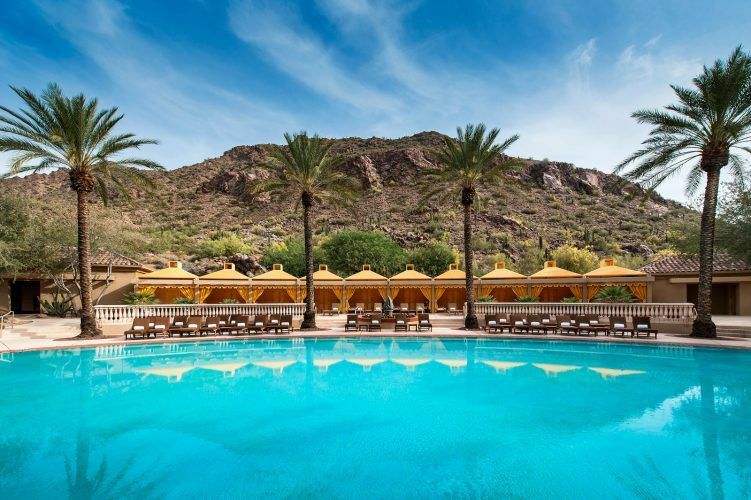 Where to Stay Scottsdale hotels cover the spectrum from spa-focused seclusion amid the red rocks to a 24/7 pool party for the whole family. Read on for six of our favorites. Hole up in luxe Hollywood style at the Phoenician’s exclusive new Canyon Suites where views encompass pool cabanas and the spectacular red rocks. Opt for spacious poolside suites with sofa beds in separate living rooms and don’t miss the kitschy new jeep safari experience — kids go gaga for it. Come spring, take advantage of the Phoenician’s fully renovated kids' club and pampering spa. Think Epcot-meets-hotel here: The fluffy resident Golden Retriever and Labrador bound out to greet you upon check-in and there are six heated pools (one with an air-conditioned white sand beach, one with two huge waterslides with disco lights and fog on the weekends) to keep the kids happy. There's also a spectacular Turkish bath spa featuring hot and cold plunge pools, indoor-outdoor treatment rooms in a waterfall setting, and a lavender inhalation room. Each festive season sees a new batch of over-the-top seasonal experiences, from an ice skating rink for the holidays to "Dive-In" movies in the pool. Guestrooms lack a real wow factor, so splurge for the higher-end suites with more recent renovations. Alternatively, book a standard and use it as a day room while you all splash your heart out. Amid a hummingbird-and-butterfly sanctuary on the side of iconic Camelback Mountain, Sanctuary feels more Palm Springs than Scottsdale, with whitewashed Frank Loyd Wright–inspired casitas. Splashy touches like freestanding outdoor soaking tubs, firepits scattered around the property, a private dining room, and a gorgeous spa and with accompanying lap pool (Olympic medalist swim trainer on request) put it a cut above the rest. The main pool is for adults only from Friday to Sunday, but kids have the run of smaller pools dotted throughout the property. There are also a number of private pool villas. 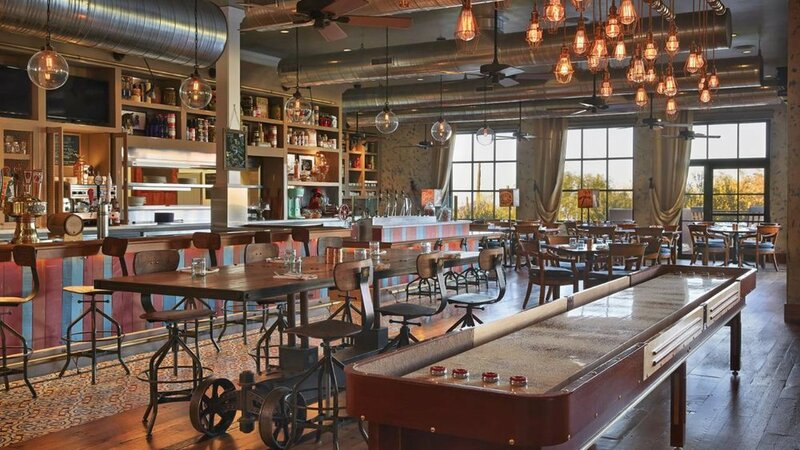 On Scottsdale’s main strip, in a convenient if not as picturesque location, Andaz’s Arizona outpost has a hip Austin outdoor motel vibe with cool details like a casual sit-down check in (with wine! ), hand-picked mid-century modern furnishings and a spa and open-air gym. Expect mixology and cooking classes in a glassed-in kitchen, and a house Tesla for dinner drop-offs. For family-friendly configurations, Kings connect to Double Queens, while Poolside Suites connect directly to cabanas for the party set. This village of adobe casitas at the famed Troon North golf course feels like the movie version of the picturesque old Southwest. A lively canteen and kids’ club hit the family marks, and the pool experience is a show stopper. Spanish Mission interiors can feel a bit heavy in contrast to the big sky and red rock surrounds, but the connecting room options and the one- to three-bedroom suites make this a firm family favorite. This sprawling red rock resort is a showcase of its spectacular natural setting, with a chic indoor/outdoor layout and fun, energetic staff on hand to help you make the most of the region. Airy two-Queen casitas are done up with a fresh, contemporary take on Southwest design, with beautiful whitewashed bathrooms and beehive fireplaces, and there’s a vast stock of independently owned villas for larger families or longer stays. There’s no kids' club yet, but the team will happily arrange desert adventures via ATV, Hummer, horseback and more.